This was the proclamation of Ketch Secor, co-founder of the Old Crow Medicine Show, near the end of their one-hour set at the first annual Buckle Up Music Festival. On this evening it was a tale of two cities, or rather a tale of two countries – music that is. At its home on Pete Rose Way, The Great American Ballpark was hosting contemporary country music stars Jason Aldean, Miranda Lambert, and the Florida Georgia Line. 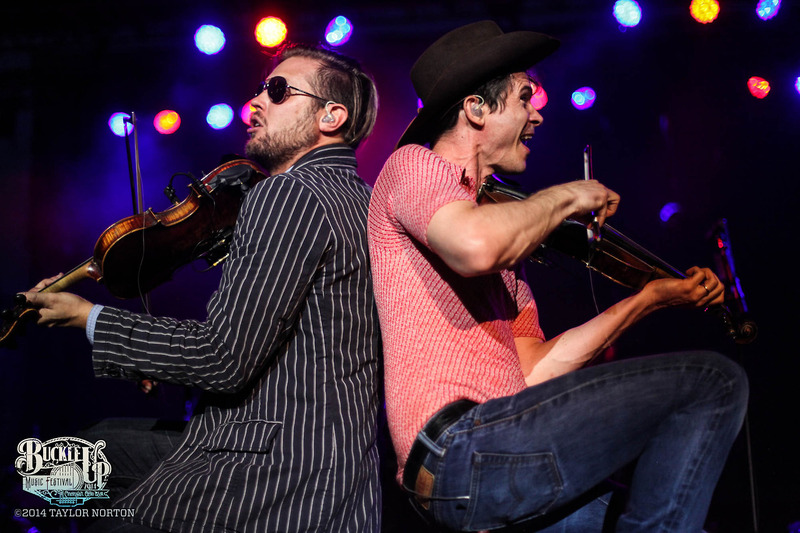 And a few blocks away from that, hugging the banks of the Ohio River, Sawyer Point Park served as the backdrop for a three-day festival celebrating a different kind of country music. While only a short walk separated these venues, an apparent schism existed between the mass popularity of country-pop and the diverse representation of the Buckle Up Music Festival. 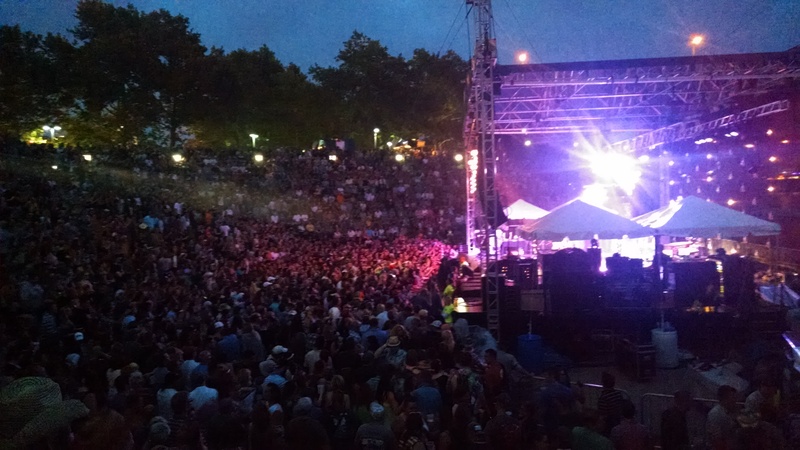 With the incredible success of the 2012 festival, organizers utilized the same formula for the 2013 and 2014 Bunbury Festivals. Organizers now had a model and venue (Sawyer Point Park) so it is no surprise the event could be duplicated with a different genre. The product of this realization was the Buckle Up Music Festival. For three days (July 18, 19, 20), over 80 different country and folk acts performed across 6 stages. Those opting to attend the entire festival were treated to a fantastic experience; however, spending a single day was far from disappointing. Since my attendance costs included the ticket price and paying the babysitter, I chose to attend on Saturday alone. Like a professional conference, decisions had to be made – we had highlighted each of the acts that we wanted to see. The schedule was well structured and ensured that at least one band/artist was performing at all times. Throughout the day it was apparent that people were camping by a stage in order to have great seats for an act; however, most traversed the park to experience the various bands performing. The festival spanned the entire length of the park and the six stages were placed in areas that utilized the built-in amphitheaters, as well as the standard temporary stages. This variety added a unique element to the event. Since attendees were required move around the park, numerous food, beverage, and product vendors could be found clustered in small villages. The variety of vendors was superb and attendees had the option of great food and drink options. From the entrance to the main stage attendees were led through an appropriately placed beer village. Where most festivals/concerts offer the standard macrobrews, and perhaps Blue Moon, the beer garden at the Buckle Up Festival encompassed an entire plaza and included vendors from six different craft breweries. Additionally, the organizers secured locations for 14 local restaurants. If that was not enough, a distillery village occupied the opposite end of the park and included a large bar (yes a real bar) dedicated to the Ole Smoky Distillery. It was apparent that the organizers had again replicated the format they learned from the Bunbury festival. Attending a festival such as Buckle Up provides excitement because of the headliners. There were certainly people in attendance who were solely interested in the main stage performers: Emmylou Harris, Alison Krauss & Union Station feat. Jerry Douglas, and Willie Nelson. These artists garnered large crowds, but it was the new bands that made the festival unique. We arrived shortly after the gates opened and thus missed the performances that occurred between 2:00 and 3:00 PM (this included the Sleepy Man Banjo Boys who I was quite looking forward to seeing). We (my wife and friends) decided that the only performance we had to see was the Old Crow Medicine Show, who were taking the River Stage from 9:00 PM – 10:00 PM. Other than that we planned to explore. Emmylou Harris was scheduled to take the main stage at 5:45 PM and we decided to visit the beer village on our way. It was just after 4:00 PM and we arrived as Houndmouth had started their set. The band, hailing from New Albany, Indiana, is young (formed in 2011) but owns the stage as if they had done so for many years. Immediately we were drawn to their effortless combination of blues, roots, and alternative country. It immediately reminded me of Ryan Adams’s early albums. There was a gritty honesty with elements of drug use, alcohol, and the blues – which can only come from rural America. During the performance it was impossible to avoid the performance of keyboardist Katie Toupin. With a voice reminiscent of Janis Joplin, she played with such vigor at times that her hair completely disguised her face. Band members contributed with the skillful playing of their instruments, and their tight harmonies took influence from bluegrass. Their performance possessed an energy and emotion that truly made them “worthy” of playing the main stage. Shortly after Houndmouth ended their set, the crowd grew significantly. It was expected that Emmylou Harris would garner a large crowd. Amidst the blankets and beach chairs we found a small spot of real estate close to stage left. 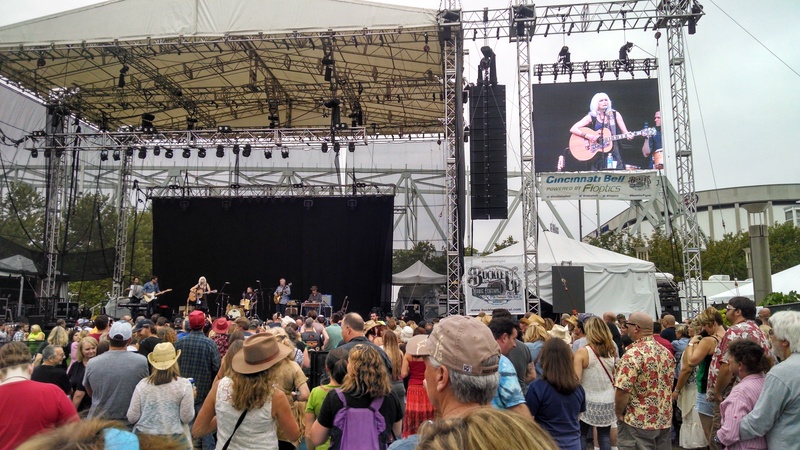 At 5:45 PM Emmylou and her band took the stage. We had an appreciation for Emmylou Harris and a respect for her talent; however, those were the sole reasons for staying for the performance. Just under halfway through her set, my wife and I decided to explore. The rest of our group opted to stay and we agreed to meet up later. All of our time had been spent in the area surrounding the River Stage and the Main Stage, so we decided to travel to the other side of the park. Performing on the Amphitheatre Stage we stumbled on The 23 String Band – a quintet from Louisville, Kentucky. All that needs to be said is that they embody pure roots bluegrass. On our walk back to the Main Stage we encountered a Boston duo named Tall Heights. The group, consisting of Tim Harrington and Paul Wright, utilize cello, guitar, and tight harmonies to craft folk-based melodies. We stayed for three songs before leaving for the Main Stage area. This was an instance where scheduling was frustrating. Back on the Main Stage the roadies were prepping for Alison Krauss & Union Station. Again we found a spot and listened. She is talented. The music is good. We intended to leave the set early to go to the River Stage in order to get seats for Old Crow Medicine Show – it was apparent that everyone else was thinking the same thing. OCMS was scheduled to take the stage at 9:00 PM. We arrived shortly after 8:00 and could not find a seat that faced the stage; rather we were forced to sit on the far side of stage left. The amphitheater seating would quickly fill and by the beginning of the set the aisles were blocked with attendees. Limited to one hour, OCMS put on an amazing performance with more energy and showmanship than I have witnessed. The stage was adorned with Mason jar chandeliers and Mason jar strands hanging from backdrop, which suggested the evening would be accompanied with subdued music. From the moment the band took the stage it was evident this would not be the case. 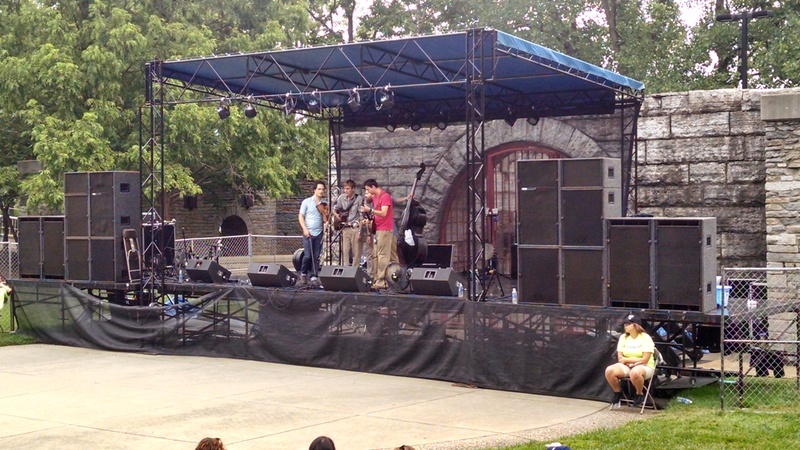 As if they were the Pied Piper of Hamlin, OCMS had encapsulated the entire crowd from their first notes. This energy transformed the crowd into the crazy uncle that every family has – for this hour all caution was cast to the wind. Their infusion of bluegrass, blues, rock, and alternative country was genuine and the performance lacked the superficial local references that elicit crowd responses. During the concert Secor integrated numerous pieces of local trivia into his patter, but it surpassed the simple “It’s great to be here in [insert current city on tour].” His comments further elicited audience response and made the forum feel as if it was exponentially larger than it was. You don’t have to play the Main Stage to be a headliner. The definition of headliner is of course subjective, and is often determined by record sales and overall mass appeal. Over the course of the three days, Alabama, Emmylou Harris, Alison Krauss & Union Station, Willie Nelson, and The Band Perry were billed as the official Saturday headliners. Each of these acts had a case for being on the Main Stage; however, with a festival such as this there is always the likelihood that the true headliner is relegated to a different stage. The Buckle Up Music Festival managed to secure over 80 bands, many of which would be headlining smaller venues. But I’ll say this — the Old Crow Medicine Show experience was headliner-worthy. As I reflect on the show, I sincerely hope they were placed on the smaller stage due to scheduling issues. Regardless of what the schedule said, they were the real headliner. On a business level, the Buckle Up Music Festival was an incredible success, and tickets for the 2015 festival are currently on sale. Was it worth attending? Absolutely. By attending one day of the festival my perspective is limited. Assuming the remaining two days mimicked Saturday, this festival was groundbreaking for the Cincinnati music scene. Unfortunately I will likely attend a single day next year (for the same reason — childcare), but would recommend, if you have the ability, committing to all three days. This festival has a great venue, vendors, and most importantly a great lineup. It is worth every penny. From the schedule, it looks like were a lot of good acts at this festival — not just on Saturday but on Friday and Sunday too. Sturgill Simpson, Alabama, Drive-By Truckers, Willie Nelson (damn shame you missed him in particular). I may just have to come out and visit next year…. For deciding to go at the last minute we were quite impressed. I hope that they can maintain the same type of lineup next year. Tickets are actually on sale right now. $50 for a single day or $109 for all three. I have it calendared.